With full service leasing available for custom-spec’d Peterbilt trucks, TLG’s fleet lease services let you focus on driving profits. TLG Leasing Locations Drop by a TLG location to discuss fleet leasing. The Larson Group’s full service leasing options let you feel at ease, knowing that our experienced staff will design the perfect fleet lease plan for your business. A trusted leader in Peterbilt truck leasing companies, TLG encourages its technicians and personnel to build personal relationships with customers, getting to know their fleet lease needs for an unmatchable service experience. True to our Midwestern roots, every last one of TLG’s 900+ employees is hardworking, friendly, conscientious, and well-trained to help TLG supply your business all it needs to get the job done right. We offer full service fleet lease options customized to fit your company’s specific needs. With TLG Leasing, you can avoid the expense and headache of maintaining your own service bays, employing diesel technicians, or tracking an inventory of parts. What else can you expect from full service leasing through TLG? The Larson Group is proud to be your best choice for Peterbilt truck leasing companies, and we look forward to earning your business as a Customer for Life. We're here to help with all your fleet lease needs. Not sure which full service leasing option is right for you? One of our TLG experts will be glad to help. 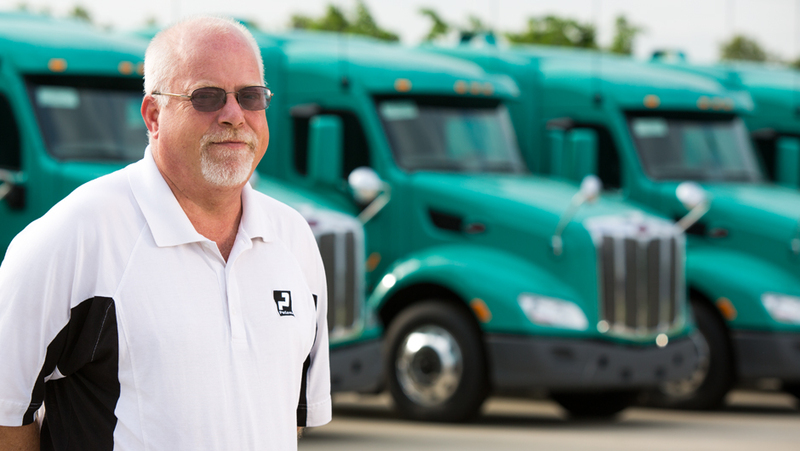 “Keeping Customers For Life” is a phrase often heard if you have a fleet lease relationship with The Larson Group. Effective service program for your non-lease trucks. Effective service program for your non-lease trucks. The right Contract Maintenance plan will fit your business, age and condition of your commercial truck fleet, routes traveled, vehicle mileage, products hauled, and application type. Instead of a so-called "standard" contract, our certified technicians customise the perfect maintenance program for your non-lease trucks. Flexible commercial truck rental solutions with Peterbilt trucks. Seasonal business spikes, new market opportunities, and vehicle breakdowns is no problem with our available commercial truck rentals. We offer flexible truck rental solutions to keep your drivers on the road and protect your brand image. With premium Peterbilt trucks from class 5 to 8 ready to roll, TLG Leasing is the answer to your short-term transportation needs. Keep your lease purchase trucks in optimal shape for reliable delivery schedule and happy customers. TLG manages your preventative maintenance needs as part of your commercial truck lease agreement or as a stand-alone service. Our factory-trained technicians will catch problems before minor repair needs become major, saving your money by preventing and organizing foreseeable downtime.